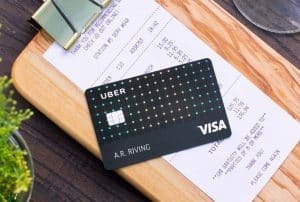 Home › Credit Cards › Uber Visa Credit Card Review – 4% Rewards Dining Out! 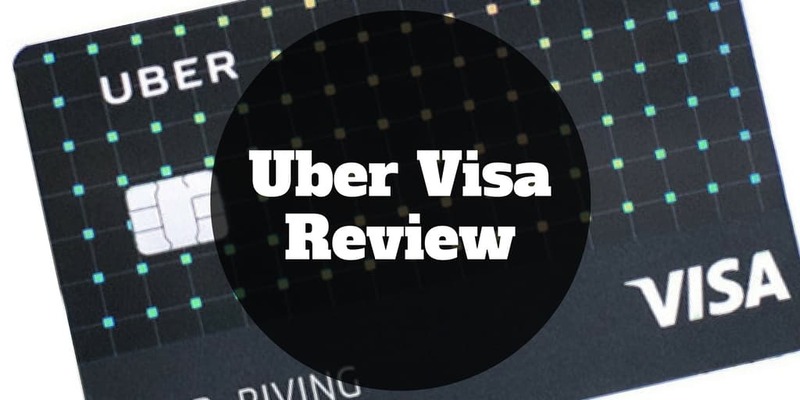 Uber Visa Credit Card Review – 4% Rewards Dining Out! If you thought the Chase Sapphire Reserve℠ credit card offered attractive rewards when eating out and traveling, you are in for a treat with the new Uber credit card. 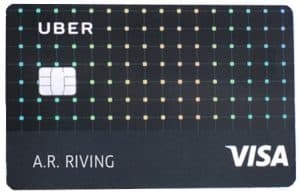 The Uber Visa credit card made available to the public on Nov 2, 2017 rivals any of the top travel and dining rewards credit cards on the market by offering a 4% rewards rate on restaurants and UberEATS charges. Plus, you receive 3 points for each dollar spent on airfares and hotels, 2 points per dollar when purchasing online and 1 point per dollar spent on all other items. Unlike other prestigious cards with generous rewards, such as The Platinum Card by American Express, the Uber Visa credit card issued through Barclays has no annual fee. Surprisingly, you won’t get extra perks when you call an Uber for ridesharing despite the fact that the credit card is branded with the Uber logo. However, you will earn 4% on UberEATS purchases as it falls under the dining category. Why Choose The Uber Visa Card? How Do Points Work On The Uber Credit Card? The Uber Visa card is about as good as it gets if you dine out regularly and travel frequently. While the Chase Sapphire Reserve℠ credit card does slightly edge out the Uber Visa card when it comes to dining and travel rewards redeemed through the Chase online portal, you won’t pay an annual fee with the Uber Visa card as you will with the Chase card. Chase lets you redeem points via its portal for an extra 50% over and above the standard 3% rewards rate. So, you effectively enjoy a 4.5% rewards rate compared to 4% using the Uber Visa card. If you have online subscriptions to Netflix, Spotify, or Amazon Prime, Uber Visa will reward you by up to $50 per year also, though you have to spend at least $5,000 annually. Nevertheless, you will also earn 2% rewards on all online purchases as well as 1% on all other purchases. Points earned on the Uber Visa card can be redeemed for cash, gift cards, or Uber credits. Spend $1 How Many Points Do You Get? The conversion between points and dollars is: 100 points translates to $1. Spend $500 within the first 90 days to earn your sign-up bonus and $5,000 annually to earn a $50 online subscription credit. While the rewards are attractive, you will be restricted from redeeming them if you have less than 500 points (or $5) accrued. To earn the 10,000 point sign-up bonus valued at $100, you must spend at least $500 within the first 90 days. And to qualify for the $50 online subscription credit annually, you must charge at least $5,000 annually to your card. For big spenders, you will not be permitted to redeem more than $500 per day in Uber credits. 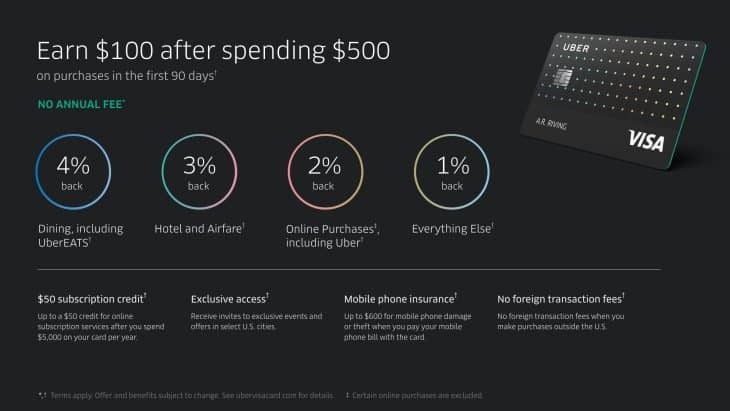 And if you want to take advantage of the $600 in mobile phone insurance for damage or theft, you must pay your mobile phone bill using your Uber Visa card. Lastly, you cannot transfer, assign or sell your points. But the good news is your points never expire as long as the program is open. The standout benefit of the Uber Visa credit card is the 4% rewards rate on dining, including when you order on UberEATS. Generous rewards are offered for travel purchases too but make sure to avoid payments using third-party apps when charging online transactions to your card or they will be rendered ineligible. ✅ 4% Dining Rewards: Dining out at restaurants, pubs, as well as ordering on UberEATS earns you 4 points per dollar spent, which is equivalent to a 4% rewards rate. ❌ High APR: Don’t miss a payment or you will be stung with a high APR rate. And this goes for cash advances too which incur eye-wateringly high interest rate charges. ✅ 3% Travel Rewards: Each time you charge an airfare, hotel, or make travel arrangements via a travel agency, you will earn a 3% rewards rate. ❌ No Points Transfers: You are not able to transfer points to airline miles so you will need to stick with redeeming points for Uber credits, cash, or gift cards. ✅ 2% Online Rewards: Whether you purchase from retailers or streaming services online, you are eligible to earn 2% rewards, provided you don’t pay using third-party payment systems, such as Paypal, Venmo, Apple Pay, or Samsung Pay. ❌ Third Party Payment Restrictions: If you use third-party payment systems to buy online, you will be ineligible to earn the 2% rewards rate for online purchases. ✅ 1% Reward On All Other Purchases: All other spending made with your Uber Visa credit card will earn you 1 point per dollar spent, which is equivalent to a 1% rewards rate. ✅ $100 Sign-up Bonus: When you spend $500 within the first 90 days, you will receive 10,000 points, which is equivalent to $100 (made available on your next billing statement). ✅ $50 Online Subscription Credit: When you charge $5,000 annually to your card, you earn a $50 credit to online subscriptions. ✅ Easy Redemption: You can redeem points easily in-app for Uber credits, as well as for cash, or gift cards. ✅ No Annual Fee: Unlike cards with similar rewards rates for travel and dining, the Uber Visa credit card charges no annual fees. ✅ No Foreign Transactions Fees: When you travel internationally, you will not be hit with penalty forex fees. ✅ Earn Points Abroad: When you spend abroad, charges made to your Uber Visa card will continue to earn you points. ✅ Points Do Not Expire: As long as the program continues, your points do not expire. Points never expire and you can still earn points when charging purchases to your Uber Visa card when traveling abroad. What transactions are eligible for 2% cash back? What transactions are eligible for 3% cash back? What transactions are eligible for 4% cash back? If you eat out often and travel frequently, the Uber Visa credit card is a virtual must-have. You can earn a rewards rate of 4% at restaurants and bars, as well as when you order from UberEATS. Even when you are abroad, each purchase you charge to your card will still qualify for points, and you won’t be dinged with foreign transaction fees. Compared to The Platinum Card from American Express and the Chase Sapphire Reserve℠ card which have hefty annual fees, the Uber Visa card has similarly attractive rewards but no annual fee. Keep in mind that you if you make purchases with third party payment systems, such as Apple Pay, you will not be eligible for the 2% online rewards. The bottom line is the Uber Visa Card is well worth exploring if you travel and eat out often, want to avoid the annual fee associated with rival cards, and subscribe to multiple online streaming services. Disclosure: Information related to the Chase Sapphire Reserve℠ and The Platinum Card from American Express has been collected by Investormint and has not been reviewed or provided by the issuer of this card.